Sansovino’s Loggetta is on the left, the Procuratie Vecchie in the centre and the south wall of the narthex (porch) of San Marco on the right. At the corner of the narthex is the Pietra del Bando, a truncated porphyry column once accessed by steps, on which Comandadori (government officials) stood to issue proclamations. In black with blue cape and red hat, one stands beside it reading a document, and is approached by the red-clad figure of a Procurator or top-ranking officer with his entourage. On the extreme right of the painting is one of the two Pilastri d’Acri, pillars thought to have been looted from Acre (in present-day Israel) in 1256, when Venice seized the city from the Genoese, but now believed to have come from the sixth-century church of Hagios Polyeuktos in Constantinople (now Istanbul), which the Venetians sacked in 1204, when they led the Fourth Crusade. The flagpole, the far end of the Piazza and the church of San Stefano are not actually visible from this viewpoint. The Campanile is included at the extreme left of the drawing but was overpainted here, to concentrate the weight on the right of the composition. The perspective of the Procuratie Vecchie is steeper in the painting than in the preliminary drawing. The balustrade at the top of San Marco’s narthex has been given a row of 13 openings in place of two groups of four divided by a central upright crowned by a finial. The columns and capitals have been elongated so that the sense of the capitals’ bulk and the weight of the four columns pressing on the single supporting column has thus been lost. 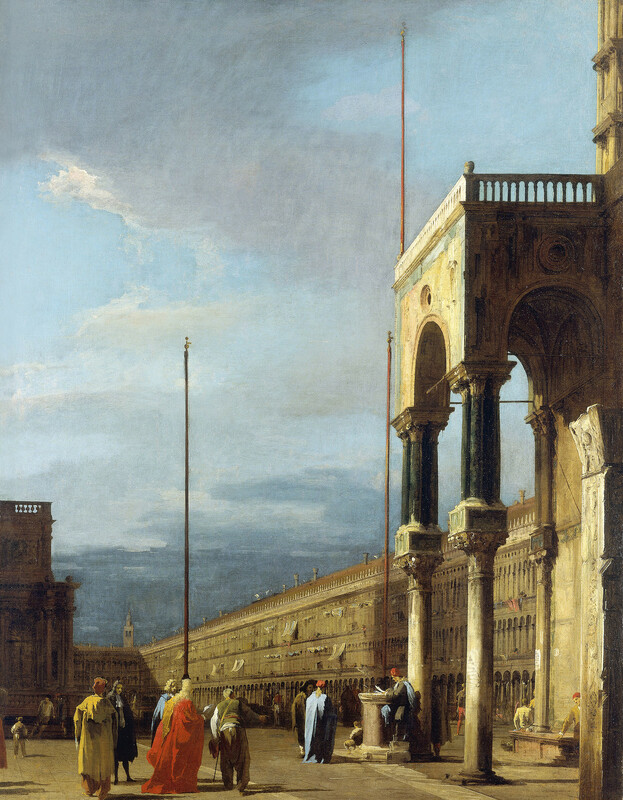 Canaletto may have wanted to simplify architectural detail, making the structure more impressive in its height by means of the more slender, taller columns. In the drawing the afternoon sun casts a shadow over the foreground, but in the painting it is a midday sun that casts a dramatic shadow at the end of the Piazza, contrasting with the foreground figures in full sunlight.